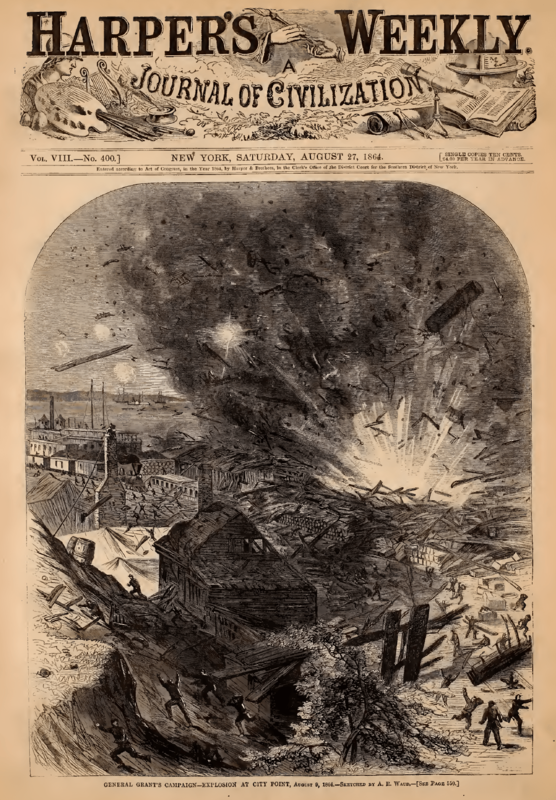 One Hundred and Seventieth Regiment, N. Y. V.
Fearful Explosion at City Point—Dreadful Loss of Life—Consternation of the Negroes—Daring of the Irish Legion, Etc. Quiet being partly restored, we emerged from our canvas shelter to learn the cause. We were not more than two hundred yards from where the explosion took place, and on casting our eyes around, we found the ground literally covered with shot and shell, and near where we stood, we picked about twenty as beautiful specimens of man-annihilators as Jeff Davis can boast of. Thank Providence! none of them came in contact with our craniums. From here we proceeded down to the scene of the catastrophe, and what was our astonishment to find houses, docks, boats, tents, in a state of perfect wreck! dead and dying strewn among the ruins; bodies torn to pieces; an arm here, a head there, a leg and other portions of the human frame mangled to pieces, at some places a distance of two hundred yards; muskets and rifles bent into every imaginable shape; ordnance-stores, including almost everything in the vocabulary, lying helter-skelter; and ammunition, of all sorts and sizes, covering the ground as far as the eye could reach. Detachments from the different regiments stationed there soon arrived on the ground, and immediately set to work removing the ruins about the barge which had exploded, and quiet reigned once more. Body after body was extricated—some dead, others dying, mangled in the most fearful manner, and the groans of the poor fellows who had any life left were pitiable in the extreme. Colonel [Theodore] Gates [of the 80th New York aka 20th New York Militia], commandant of the post, and Brig. Van Rensselaer, commanding the Twentieth New York [Militia]4, having now arrived, everything went on like clockwork; and, indeed, too much praise cannot be bestowed on both these gentlemen for the manner in which they exerted themselves to restore order and relieve the wounded. We proceeded from here to the camp and houses in the village, and about every tent more or less perforated, and the interior of the houses divested of their plaster—some of them not having a solitary pain [sic] of glass left—yet, strange to say, very few were hurt; although from the appearance of the ground, it was very evident that there was ample cause for considerable mortality. After an hour or so, we visited the scene of the explosion again, and found that some twenty dead bodies, principally colored men, had already been extricated from the ruins, besides several who were fearfully wounded—many so badly, that amputation had to be resorted to. It was impossible to learn the exact amount of mortality or damage done, but, on a rough guess, we should think that one hundred covers the number of killed and wounded. The damage done to Government-property cannot be much less than half a million of dollars. All sorts of rumors are afloat as to the cause of the explosion, but are merely surmises. There is very little doubt but what it was purely accidental.5 So far as we were enabled to learn, a large barge was lying alongside of the wharf, loaded with ordnance and ordnance-stores, and was being unloaded, when suddenly an explosion took place, resulting in what I have already stated. It is very probable, and I do not see anything more likely, than as the barge was being unloaded at the time, some colored man, who was ignorant of what he was handling, dropped a percussion-shell, which immediately exploded, and hence the fearful catastrophe that followed. It is, nevertheless a matter which requires thorough investigation; for, if proper care was taken, no such accident could have happened. I forgot to mention that the steamtug (fire-boat) Chilli was on hand immediately after the occurrence, and got eight streams of water playing on the ruins, which was the cause of preventing any further disaster, for another barge lay quite near the scene, also loaded with ammunition. 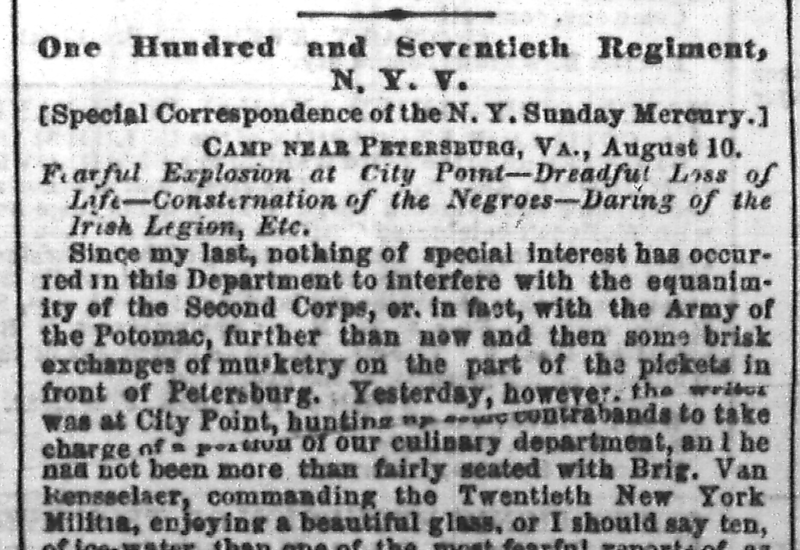 The regiment [170th New York] is in the best of health and spirits, encamped in a wood near Petersburg, waiting orders. We are expecting some active work again in a few days. Do advise Uncle Sam to allow us an opportunity to recruit. A regiment that has fought so manfully, and lost over two-thirds of its number in this campaign, and that has never been beaten, should have its ranks filled up.